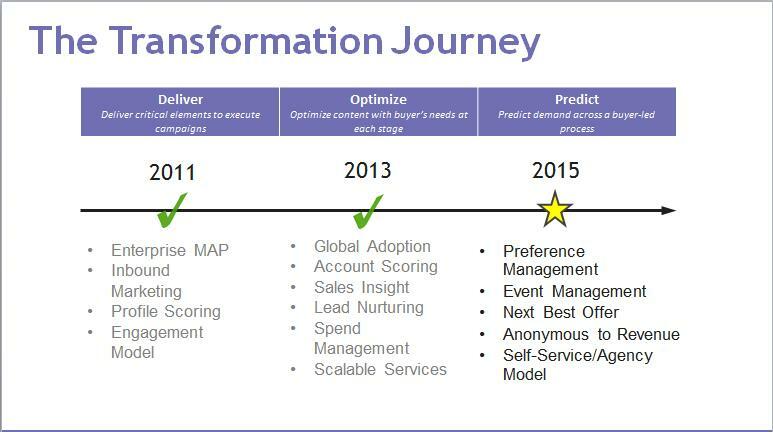 SiriusDecisions Summit 2015: B2B Marketers Unite! Whew! 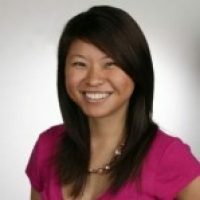 What a week for B2B marketers! Over 2,000 marketing, product, and sales leaders two-stepped their way to Honky-tonk Central, aka Nashville, TN. Why, you ask? 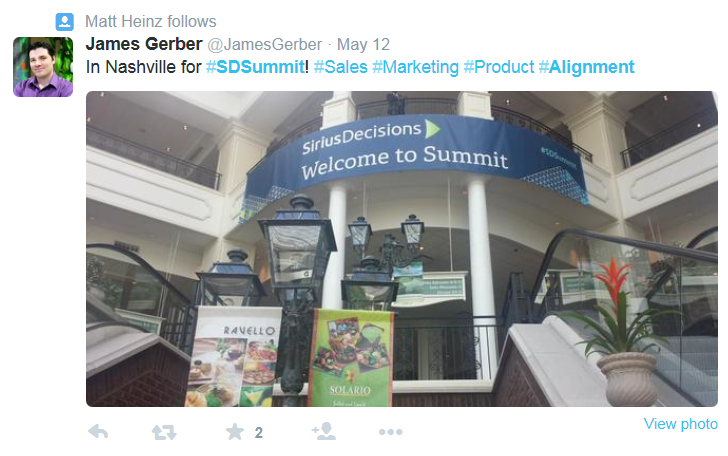 To attend the fabulous 10th annual SiriusDecisions Summit, that’s why! This is a must-attend event for B2B marketing leaders who are eagerly awaiting the release of new frameworks, demand waterfalls, and best practices to implement in their businesses. The invention of the chainsaw crushed Paul Bunyan’s tree chopping game. Similarly, the growth of marketing technologies has completely changed how organizations can efficiently deliver engagement marketing to prospects and customers. Marketing technology investments have nearly doubled in the past four years, and CMOs, CPOs, and CSOs who are not tech-savvy will have trouble finding (and keeping) a job in the next 10 years. The call to arms has been issued: instead of hiring more sales reps, make the existing reps more productive using technology. “Show up every day as if it’s your first day; bring that same passion and energy!” NBA legend Magic Johnson inspired the crowd and jumped on the selfie bandwagon, stopping every few feet to take a photo with an unsuspecting audience member. Magic (we’re on a first name basis now, right?) shared his maniacal focus on getting to know your own strengths and weaknesses, and understanding your audiences and customers. He admitted his own need for control, sharing with us that he’s a control freak but tries to stay in his own lane to let his people do their job. He also shared his humbling story of cold calling CEOs for advice when he first started in his business ventures. Many of them hung up! Can you imagine? Clearly, we are all lifelong learners, and Magic is the epitome of consistently striving for excellence. I was shocked to learn that only 1% of a company’s success is about vision; 99% is about alignment. Marketing, sales, and product alignment is driven by a set of common incentives: fixed, variable, and shadow. Incentives have to be a part of the planning process as closer alignment between these functions can drive up to 36% revenue growth and 15% higher profitability. Focus on the organizational ecosystem instead of the org chart and drive alignment using the four phases of cross function workflow: strategy, build, execute, and measure. After all, companies that have aligned sales and marketing deliver 19% more growth – all the more reason to jump on board the alignment train! The single most interesting tidbit I took away is that even though it’s clear that the demand for digital marketing skillsets is exploding, organizations only spend about $900 per year on upskilling their marketing talent. Marketers have to take learning new skills into their own hands to keep up with market demand. Courses like the Marketo University and Certification process help to build the necessary skillsets that are driving the transformation in marketing. We want to hear from you: What did you take away from the conference? 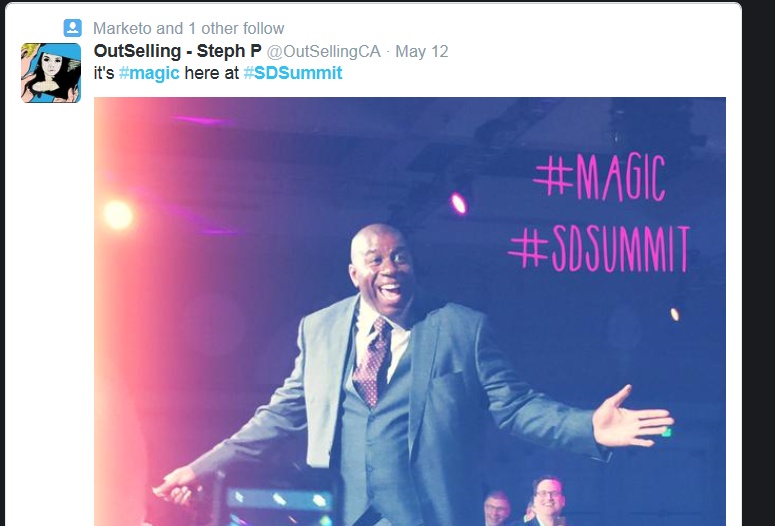 Did you score a selfie with Magic Johnson? Leave your comments in the section below!